The Pyle PWPBT67 Audio Receiver Wall Plate adds convenient Bluetooth audio streaming and control where you need it. Mount the system in-wall for instant wireless music streaming with the ability to connect to your home theater. Quick and easy installation fits into standard size electrical/gang boxes and can be installed in virtually any wall at home or in the office. Wall plate features include rotary volume control knob with touch button controls, AUX (3.5mm) audio input for connecting external devices, RCA (L/R) outputs for amplified system connection and dual USB device charging ports. The audio receiver includes a power supply adapter along with integrated RJ-45/Network Ethernet jacks for optional system connection. 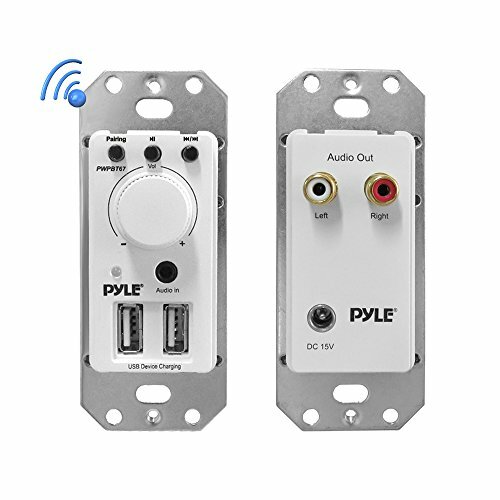 Enjoy versatile and wireless audio control with the Pyle PWPBT67 Bluetooth In-Wall Audio Control System. EZ INSTALLATION: Install the Pyle In-Wall Bluetooth Audio Receiver on any wall in your home or office. Connect to your home theater and additional external devices and let it give you versatile surround sound experience that is easily accessible. BLUETOOTH CONNECTIVITY: Features a built-in Bluetooth which allows you to stream music to a connected intercom or speaker system hassle-free. It has a wireless range of up to 50 feet. Compatible with all of today’s latest smart devices. 2 WALL PLATES: Package includes two (2) wall plates: the Bluetooth audio source where the AUX IN, USB ports and rotary volume control can be found, and audio output where the RCA connectors and optional DC input are located. DUAL USB PORT: The audio controller features dual USB 5V ports for charging devices. Compatible with iPhone, Android, Smartphone, iPad, Tablet, PC, etc. Allows you to continuously stream music using your device! TOUCH BUTTON CONTROLS: The audio receiver features crisp and responsive touch button controls for BT pairing, play/pause, and previous/next. It also features an adjustable rotary volume knob for convenient audio adjustments.